Thank you Sara Lee Desserts for sponsoring this post! Click here for more deliciously easy recipe ideas. 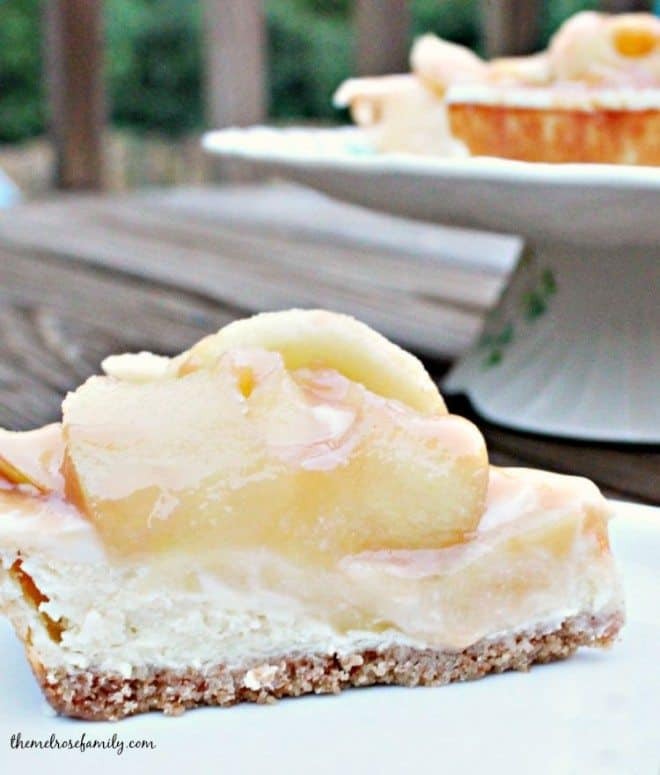 It is officially Fall since Labor Day has passed, which means time to bring on the apple recipes. Since moving to North Carolina we end up with quite a few unexpected guests so I like to be prepared with an easy go-to recipe and this is definitely one of those. We literally found out about a month ago that I have cousins that live down the road from us. Who would have thought? Luckily, this Caramel Apple Cheesecake is the perfect dessert to impress, while requiring very little work at all. I’m all for making homemade cheesecakes, but when I’m in a pinch I like to rely on a Sara Lee Frozen Cheesecake Dessert. 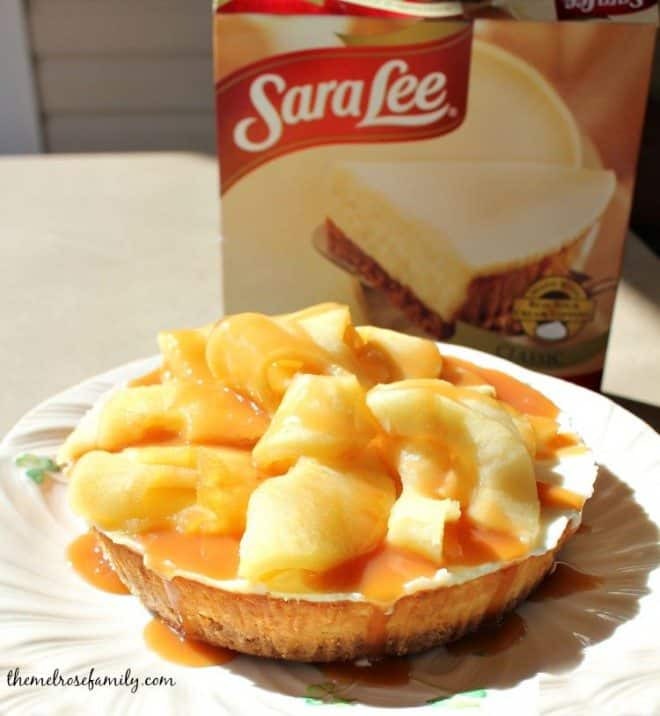 It’s easy to take a Sara Lee Frozen Cheesecake and make it uniquely yours and that’s exactly what we did with this Caramel Apple Cheesecake. 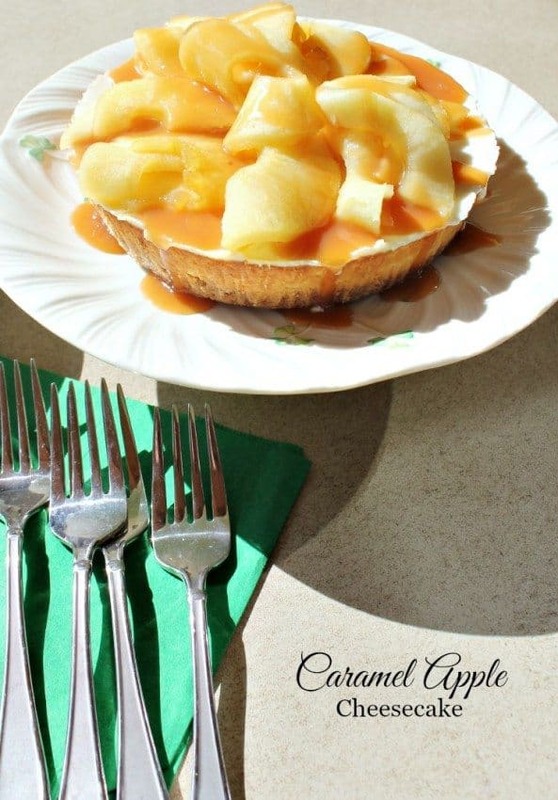 We were able to make the perfect caramel apple topping using ingredients that we had in the house, all the while knowing that we’d have the fresh taste of a Sara Lee Dessert as our base. 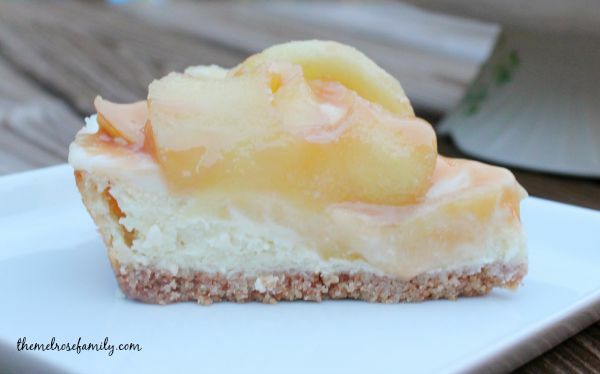 One key thing about this cheesecake is that in order to create the apple rounds I used my apple peeler, corer and slicer. 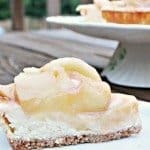 I’m pretty sure that I’ve shared my love of this nifty device when I made my mini apple pies, but it is essential in this recipe. Not only does it make it a cinch to peel the apples, but it slices the apple into rounds. I believe the rounds are what take this cheesecake from ordinary to something unique. They make the caramel apple cheesecake just a bit fancier. One of the reasons that I was so excited about this recipe is that I used ingredients that I had on hand to create the topping. We managed to get out apple picking already so we had tons of apples as well as fresh pressed apple cider from the farm. You could always substitute apple juice for the apple cider, but I love using fresh, local produce when I’m making a fruit dessert. A simple cheesecake perfect Fall that comes together in a matter of minutes. Remove the Sara Lee Frozen Cheesecake from the tin and thaw in the refrigerator for four hours according to the package instructions. Just before serving prepare the apple topping. In a large saute pan or skillet, bring the apple cider, vanilla extract and sugar to a boil. Continue to boil the liquid until it is reduced to 1/2 cup. Stir in the butter until is melted. Add in the apple rounds and cook until they are soft and caramelized. Top the thawed cheesecake with the warm apples and top with the caramel syrup. Be sure to check the Sara Lee Desserts Facebook page as well as Sara Lee Desserts on Pinterest for more inspiring #UniquelyYours desserts. What’s your favorite way to customize your Sara Lee Frozen Desserts?